During the First Era, when the Yokudan rulers were still establishing a foothold in the Alik'r, they faced a great threat from a group of elven necromancers. Legend states that the necromancers of that time were far more powerful than those that came in later eras. According to Redguard tradition, striking the dead carries with it a terrible curse and is considered an act of dishonor. Because of this, fighting back against necromancy proved difficult. In response, three Ansei heroes, Majah, Radan and Halelah sacrificed themselves to protect the Alik'r from the risen dead. As part of a covenant with Tu'whacca, they pledged their souls and each Ansei channeled their spirit into the blade they wielded in life. 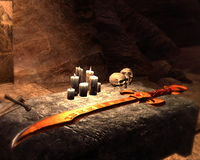 These swords became known as the Ansei Wards, and as long as the dead are consecrated in the name of Tu'whacca, they could not be raised by even the most powerful necromancy. The Wards were locked in a fortified subterranean storehouse below Sentinel, known as the Impervious Vault, and sealed with a magical barrier. The spirit of each Ansei remained tied to their Ward, meaning it would be with it at all times. 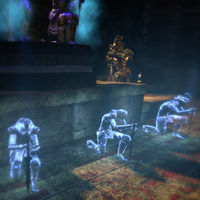 In 2E 582, a group of necromancers called the Withered Hand threatened the Alik'r with attacks from risen dead. Led by the brothers Uwafa and Alasan, they plotted to take revenge for the death of their father Suturah. Several years prior, Suturah led an army of undead against King Fahara'jad, but with the aid of the Ash'abah he was killed and his family disgraced. In order to raise a more powerful army to strike back against Fahara'jad, Uwafa and Alasan needed to remove the protection the Ansei Wards provided. They bypassed the magical seals on the doors of the Impervious Vault by tunnelling directly into it. Once inside, they stole the Ansei Wards and escaped. They began to search for the birthplaces of the Ansei guardians, as these locations were required conduct dark rituals and corrupt the wards, weakening their power. In doing so, this allowed the brothers to not only raise the deceased people of the Alik'r, but also their most legendary ancestor warriors. King Fahara'jad was against ordering his soldiers to strike down the honored dead. Such an act would cause an outcry, and possibly lead to rebellion. Instead, he called upon the Ash'abah to aid him once more. The Ash'abah, with the aid of their newest member, fought back against the Withered Hand. They discovered Uwafa had taken Ansei Radan's ward to Tu'whacca's Throne, and began raising powerful warriors. A battle took place, but Uwafa was slain and the Ward recovered and cleansed. Ansei Maja's ward was taken to her birthplace in Tava's Blessing. Alasan had taken over the town with an army of undead Ra-Netu, and was attempting to use the Ward's power to become a lich. The Ash'abah stopped the ritual and trapped the spirit of Alasan inside the Ward. In doing so the Ward was shattered into pieces, but with the aid of Ansei Maja's spirit the Ash'abah repaired the ward. In their search for the final Ward, it was discovered that Shiri, the researcher who had been helping the Ash'abah, was in fact the sister of Uwafa and Alasan. Shiri was a powerful necromancer in her own right, and she fled to the Motalion Necropolis in Satakalaam to continue the Withered Hand's scheme. The Asha'bah, Prince Azah and Throne Keeper Farvad arrived at the Necropolis only to discover she was attempting to raise the remains of her father Suturah. They battled with Shiri, but just as she was about to die she sacrificed herself to raise Suturah as a lich. Ultimately, Suturah was also defeated and the final Ward belonging to Ansei Halelah was recovered. They Ash'abah returned to the Impervious Vault and placed the three Ansei Wards back into the statues that previously held them. King Fahara'jad held a small ceremony honoring the Ash'abah, and ensured the seals on the vault had been strengthened. He also commissioned several decoy Wards. The spirits of the Ansei returned to maintain vigil over the living and the dead, and ensure that both adhere to the divine laws of Tu'whacca. This page was last modified on 24 October 2018, at 16:30.